I do not know how to display my POI-Data on the map-screen. Only the selected POI is visible. Is it possible to show all POIs on the display? I make small groups for different things (sortet by countries, campings, ..) and save them on the disk in different .GPX-Files in one Folder. I have multiple custom POI files loaded in my 60CX and when I do a Find for a waypoint (POI) and go to the Map page, I see all my custom POIs displayed. Some of mine are close enough to show many on a given map page view. And they vary from my separate POI files, not only just from one database. I also cannot see POIs on my display when I have no destination selected. I'd like to see the distribution of POIs in the area, but I can only bring up a POI through the Find menu. Does this have anything to do with not having any maps loaded? I haven't bought any MapSource maps yet, but I loaded some custom POIs. Ah ha! I discovered how to see all our custom POIs without going thru the Find menu! On your Map page, select Menu/Setup Map/Menu/Show All. It will now show all your custom POIs when on the Map page. Cool stuff! Thank you - now it works. On my 60cx I'm not able to do this. I have custom POI's loded, and do not have any custom icons assigned. I can search the Custom POI's and get a list, but am unable to display more than the one I'm searching for on the map page. When I follow your instructions, "Menu/Setup Map/Menu/Show All", I don't get the "Show All" prompt. Instead I see "Restore Defaults" or "Restore All Map Defaults". Well, I'm editing this post, since I've now become able to see the Custom POI's, but only at a display of 500ft or smaller. I can see them zoomed out to 800 ft, but not any more than that. Is there a setting that I am not seeing? I don't have my Map 60CX in front of me, but I know you can change the zoom level where you can see or hide user waypoints, and the custom POIs should fall into this category. There should be a zoom level you can set for user waypoints (geocaches) to show on the map. Go to the Map page/Menu/Map Setup, then to the points screen, then user waypoints. I'll check first hand in the morning to see if I remembered correctly. *sniff sniff* What smells like blue? I set everything to 3 mi and still no POIs displaying. These settings allow me to see the Geocache icons stored on the 60cx (not the memory card) via Mapsource, but does not allow me to see the Custom POI's loaded as a gpx file via POI Loader (stored on the memory card). I've also had no luck seeing the custom icon bitmap I've named the same as the gpx file, and in the same folder. What gets displayed is a few purple pixels, possibly a corner of the bmp which has a purple looking background. I had a chance to grab my 60CX tonight and I have to agree with bsx and CeruleanCat. I tried everything I can think of and the 800' zoom level is the limit. Anything greater than the 800' zoom level and the custom POIs are not displayed. I can live with that. I can "live with that," but I don't have to be happy about it. I just want to be able to store unlimited amounts of caches as POIs and see them on the map when I'm zoomed out to a reasonable distance. I'm thinking the entire state of Florida would be good. My Custom POI disapear at 800 foot zoom, and cannot control the zoom on the setup page either. If anyone finds a way to change this setting somewhere in the menus, please let me know. Hey, you're lucky, my POIs disappear anything higher than 80m zoom. To view your POI's out to the 800ft zoom, You need to change the settings on the map set-up page. Under the General category find Detail and set it to MOST. On the map page, ...but not the "Map info" choice of the map page..
Menu> setup map.....chg Map Points to 0.5 miles and chg User Waypoints to 0.2 miles. Internal POIs will so up at 0.5 miles and User Waypoints will show up at 0.2 miles. I don't have an "X", so no custom POIs, but they will show up at one or the other of those distances, so you can adjust to taste. yeah, turning on declutter helps. And I've set Map Points to 300 ft too. Ok, I've got points scattered all over a couple of square miles. Are you guys saying that 800'x800' is all I could display on the screen at one time? If so, that's a bunch of major crap! Would be impossible to get any kind of a visual frame of reference. And I'm still not sure what is meant by having to assign an 'icon'???? This is pretty good, the screen is about a mile tall at 800 foot zoom. The Zoom scale at the bottom is about 32 or 33 pixels wide at the lower left, out of a total of 160 pixel wide screen, so Id say it is not bad. I did a calculation, and at my location, my screen is about 5400 feet by 4000 feet at a zoom of 800 feet. Edited March 5, 2006 by GOT GPS? How can we get the text to display on the map with the icon? How do I delete everything that's on this card? I don't have a microSD card reader or a microSD to SD adapter. Is there a way to delete everything from the GPS unit? EDIT: Ok, I had to shut off and on the GPSr and Mapsource would work correctly after that. OK..I have no problem loading a ton of custom waypoints (catches) in my 60CSx, now how do I delete that (those) database(s)? I've searched and fumbled long enough to need help. Try sending an empty file through POI Loader? Thanks...it wouldn't take with an empty folder, so I downloaded one local cache as a pocket querie. When I loaded that..the files in the 60CSx custom POIs vanished. Here's another question related to POI's. How do I get comments to show up when using POILoader? I have lon,lat,name,comments in the csv file, but comments don't show when I select a POI. Also never have gotten custom icons to show either. I put bmp files in the folder with the same file name as the csv files. Mine show up. You can have up to 88 characters within the comment field. Perhaps make sure your "comment" column has the cells formatted as "general". Mine are formatted this way and I get my entire comment when selecting a custom POI that I created as a .csv file. I have tried lat, lon,name,"comments" with the comments within double quotes. I also have 16x16 pixel icons of the same file names in the folder. Still gettting the little 'square' icon. Planewood, email is on the way. I also can not get an icon to show anymore than the little blue square. A bunch of us have emailed Garmin tech support regarding this. They replied asking for my sample data and they are looking at it all. Do POI data points/ waypoints work on any GPS and can you set up a proximity alarm for your POIs? How hard is it to do this on say a Garmin Legend Color or a Ique 3600? Custom POIs can be loaded on Garmin units using the microSd cards. I have a 60CX and have been loading them literally by the thousands at a time. As far as proximity alarms it does give you the option to assign an alarm (proximity) distance (per custom POI file) when uploading them. I personally have not used them this way, but it seems it should work. One thing I noticed is if you chose to assign proximity alarms, this info gets displayed vs any "comments" text you might want. This is all I get when I load your poi. Ok, planewood, we're getting close now. When you are about to upload the POI file, you will see at the left edge; "In Express mode, POI Loader will...", and the box at the right probably reads "Express". Change that to "MANUAL". It will then load all the comment text, and not throw in the useless (in this case) range/speed info. AH! I had been using manual, but had been providing proximity setting. With out checking the box at the top of the screen for each file, it works. I'm now seeing comments! Hey Garmin - Can you tell us how to get Comments AND Proximity settings using POILoader? I want proximity settings of 20' for some of my POI's. another interesting question: for creating POI's, what is the most effective format to export waypoints to from GSAK? loc or gpx? I'm quite sure POILoader strips off some data and keeps only a small percentage of it, but does it makes any difference to use one or the other format? 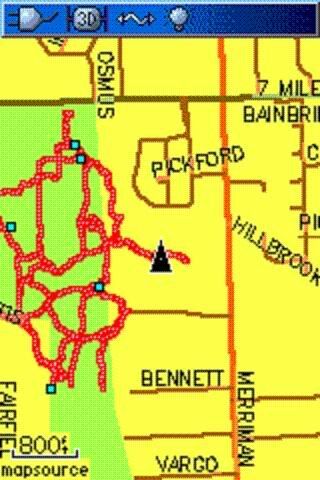 I use the .gpx format. This way I can use GSAK when working with GC.com waypoints and export a lot of helpful info, such as a total of 132 characters (for 6 lines/22 characters per line) worth of comment. The relatively small increase in file size is not a factor when you have the microSD card. I use the 256MB card in my 60CX. Thank you for contacting Garmin International E-Mail Support. updated on any other developments. contact Garmin Product Support at 1-800-800-1020 or via E-Mail. 2- About the size of gpx compared to loc, a 13 to 1 ratio is quite big for my 64Mb card... I'm waiting for the 1Gb anyway, but I was just wondering if using a gpx or a loc would produce different file size on the microSD card, or if POILoader was just taking what it needs so in the end it would be the same to use one or the other. Thanks TTW, that helped a bunch! Glad that I revisited this thread. That's sort of the problem I'm having. I'm using GSAK, i export my geocache list as a GPX file and it loads, but instead of comments all I get is proximity alarms. How do I change it so I get the comments? I also can't seem to export as the CSV file, it always just says it's invalid. I'm using a legend CX with 64mb microSD if that makes any difference. Apparently the latest version of POI Loader has a bug (from what I've read on this Forum) that defaults to proximity alarms and is not allowing comments. I have not seen this. I'm using a previous version and all is well on my 60Cx. Your 64MB card would be fine, unless you have used all available memory for mapping. One of my 500 waypoint custom.gpx POI files is under 500K by the way. Does anybody have an earlier copy of the POI loader that works, that you could e-mail me or msn transfer? Sunyjim, email me and I'll send over the previous version that works fine for me. Anybody have any more info on this? I am using a 76 instead though. I am experimenting with the POI loader and not getting hint data rather proxsimity alarm info.